Rosy Outlook: Pop of Red + Fashion Frenzy Link-Up! 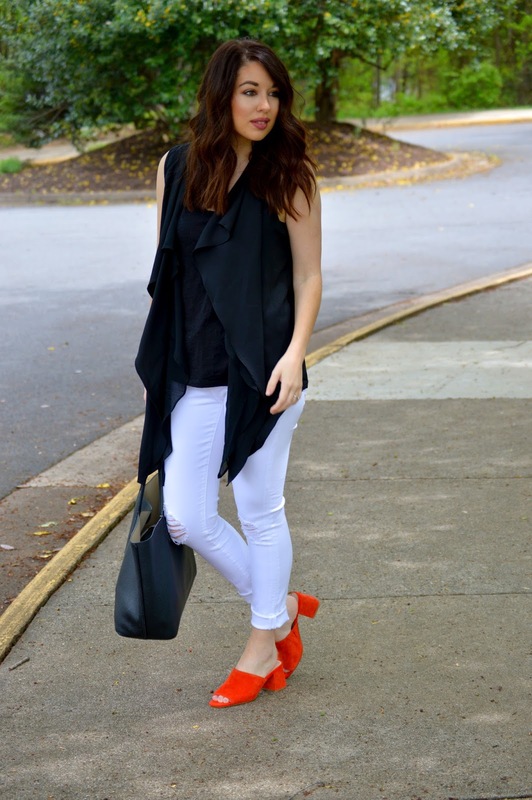 Pop of Red + Fashion Frenzy Link-Up! Happy Hump Day! Crazy that this is my last post for the next week and a half while I'm away for the wedding/mini-moon. I thought I would go all out and not only do a blog post but I also have a new video for y'all linked below! I've had so much fun filming videos lately and I wish I honestly had started doing it sooner. These fun mules are included in my video along with my other top 5 Spring Essentials. I hope you guys enjoy it! The wedding weekend itinerary is pretty much us arriving and checking in to the Inn that is on-site at our venue on Thursday. We are going to get a massage at the spa there and then just drop off the decor and go out to dinner with our friends and family that are arriving a day early. Friday, obviously, is the rehearsal and rehearsal dinner which will be so fun! We're going out for a few drinks after the rehearsal dinner as well with the rest of the out-of-towners. Saturday is wedding day and I couldn't be more excited! I'm definitely nervous but I just keep reminding myself that God will be watching over us and it will be just a beautiful day no matter what. Sunday, we're doing a little brunch with friends and family then we come home to get packed and Monday we leave for the beach! Love y'all so much and truly appreciate all your kind words, advice, and well wishes as I've gone through the wedding planning process. I can't wait to share pictures from our special day when I get back!! See you on May 8th! Talk about a pop of color fun! Aren't those the most adorable shoes! You look so sweet and thank you for including my ensemble from last week! Have a great day beautiful girl! This is the perfect pop of red! Love it paired with the black and white, too. Yay for wedding weekend! I hope that you have an absolutely gorgeous day and I can't wait to see pictures! Enjoy the weekend and your honeymoon! I am so obsessed with your mules! They are adorable! And congratulations on your wedding weekend! I hope you enjoy every moment!! You are getting so close. Yay!! Love those mules. I am on the hunt for a blush pair but am having trouble finding a pair that fits. What a classy outfit! Super cute. It's going to be a beautiful day. God is in control. And I am loving this pop of red. Mules are growing on me. Might end up getting a pair. 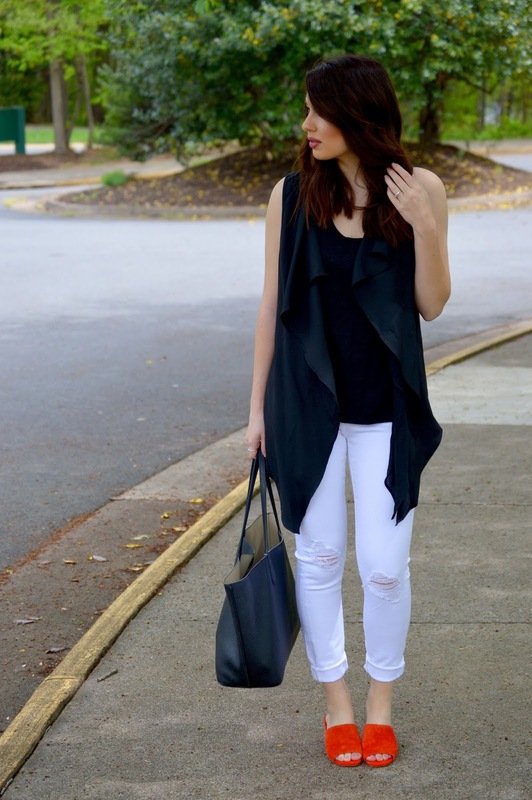 Loving this black and white look! 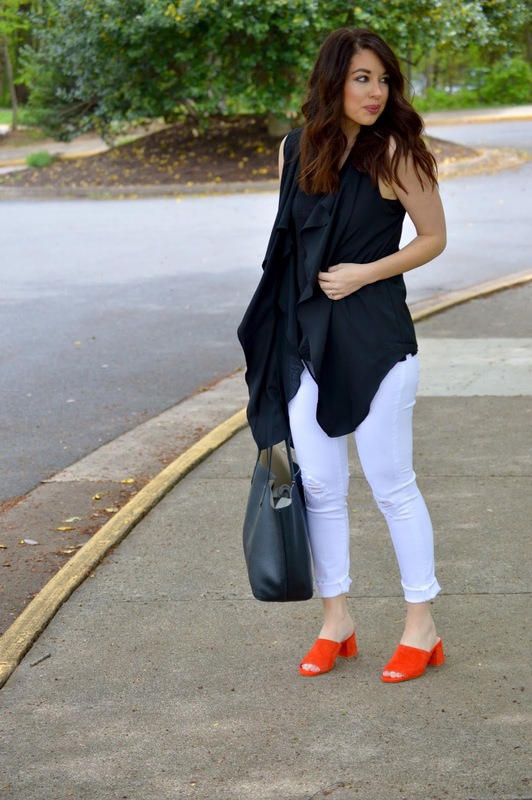 The red mules totally make the outfit! So cute! I love the pop of red with the neutral blacks and whites! You look gorgeous, Kelly! Such a great look! 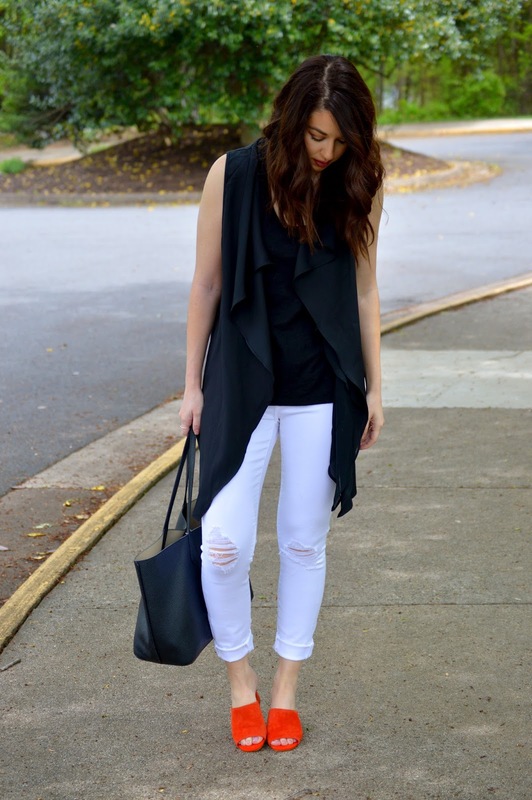 I love your draped vest, and those mules are the cutest! Yay! Have so much fun this weekend and congrats again! 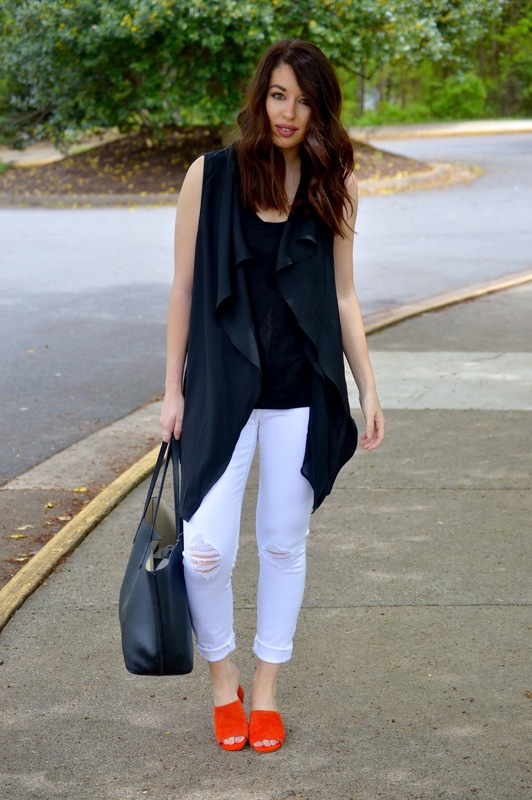 Those shoes are the perfect pop of color for this look! I love the whole outfit!! Specially the shoes! Ahhhh, it's HERE! So excited for you! Have an amazing wedding + mini moon! And PS those slides are amazing- love that color. How exciting, girl, only a couple of days until the BIG day!!!! I know it will be a success and you will make for such a gorgeous bride. As for your outfit, I adore the pop of red and your makeup looks particularly striking in this post; I love that lip color! Thanks so much for sharing, beauty, and I hope you're having a great week so far!